This small oasis is located on the banks of a seasonal river - surrounded by the resident lion pride, plains game, large knobthorn, leadwood and marula trees - in the western savannah region of Ezulwini. The lodge features super accommodation, gorgeous lounge areas, dining rooms and decks, sumptuous leather armchairs, exquisite leadwood sculptures and original paintings by David Johnson. Billy's Lodge also boasts the "finest wine cellar in Africa" set against the natural rock face and resembling an ancient Bushman cave. Superb chefs and rangers will ensure you enjoy the ultimate getaway. 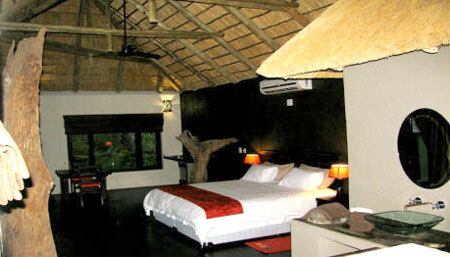 Rated in the four star category by the Tourism Grading Council of South Africa. This charming, most exclusive lodge, has luxury thatched twin bed chalets with en suite bathrooms, with accommodation for a maximum of 8 guests. This guarantees tranquility and exclusivity. The accommodation is modern, yet traditionally African and is rated in the four star category by the Tourism Grading Council of South Africa. The day typically begins with an early morning game drive, in search of Africa's exciting fauna, possibly the Big 5, followed by a sumptuous breakfast on the deck. 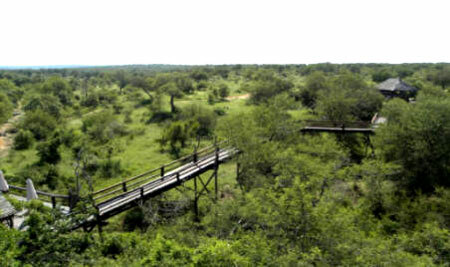 You can then go on a ranger-guided walk through the bush and learn about game tracks and the little creatures. Discover how the local people use trees to make toothbrushes and toothpaste, tea and coffee, poultices, etc. Alternatively relax in a cosy leather couch, enjoying the animals at the water, and the ever present bird life in one of the top birding areas in South Africa. After a light lunch, relax in your accommodation with a selection of wildlife books and videos, or cool off in the pool in summer. Then head out for the evening game drive in an open wildlife Safari Land Rover, stop for sundowners with unparalled views, deep in the Ezulwini Bush. A tasting in our wine cellar followed by a Boma dinner, prepared by our master chefs, under a star-studded night sky, completes the day.